The Magnum 2300 BFF semi automatic case erector allows one operator to quickly form & seal the bottom of up to 15 uniform empty cases per minute. This easy to use system provides an increase in productivity of 3-4 times over labor intensive hand taping, while significantly improving ergonomics to reduce repetitive motion strain. The low investment cost means the Magnum 2300 BFF also works great as a back-up to a fully automatic case erector and can be used to boost packing line output during peak business seasons. 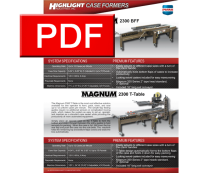 The Magnum 2300 T-Table is the most cost effective solution available for one operator to form, pack, close, and seal up to 12 uniform cases per minute. The simple flap folding guides require no additional sensors or complicated moving parts, which makes the system is as easy to set up, operate, and maintain as a standard case sealer while providing the productivity of more automated equipment. Simply place an opened case on the T-Table to form the bottom and slide it forward between the entry guides to hold securely for packing. When the case is full, fold down the top rear flap and push the case into the side belts for the machine to take over. The remaining top and bottom flaps are folded closed and sealed automatically. The Magnum 4500 BFF semi automatic case erector allows one operator to quickly form & seal the bottom of up to 15 empty cases per minute, and will automatically adjust to random case sizes. This easy to use system provides an increase in productivity of 3-4 times over labor intensive hand taping, while significantly improving ergonomics to reduce repetitive motion strain. 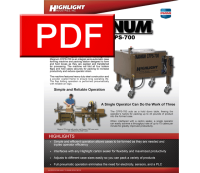 The Magnum 4500 T-Table is the most cost effective solution available for one operator to form, pack, close, and seal up to 12 cases per minute, and will automatically adjust to random case sizes. The simple flap folding guides require no additional sensors or complicated moving parts, which makes the system is as easy to set up, operate, and maintain as a standard case sealer while providing the productivity of more automated equipment. The Magnum CFPS-700 is an integral semi-automatic bottom flap forming machine and packing station. Designed to increase productivity and reduce worker strain, the machine will fold all four bottom flaps and hold the case securely for packing on the unit. The CFPS-700 acts as a hold down table, freeing the operator's hands for packing up to 45lbs of product. When integrated with a case sealer, a single operator can easily achieve a production rate of up to 15 cases per minute. The machine features heavy duty steel construction and a powder-coated frame. The flap folding operation is performed pneumatically with reliable air logic.